High-density effects in urban Hong Kong: what do we know and what should we do? Title： High-density effects in urban Hong Kong: what do we know and what should we do? Contemporary society has been undergoing what Philip Hauser (1968) has called the “social morphological revolution”. This revolution includes the remarkable increase in the rate of world population growth, the increasing concentration of the world’s peoples on urban areas, and the increasing heterogeneity of populations sharing the same geographical area and life space. There are now over 4 billion people in the world, of which about 38 per cent are living in towns and cities. The population explosion and implosion have resulted in not only high-density living in urban areas but also diversity of urban populations in ethnicity, language, cultural traditions, and social organizations. A major source of the social morphological revolution is the accelerated tempo of scientific and technological development. It is the scientific and technological progress that have substantially reduced the death rates and have also permitted the ever larger agglomerations of the different kinds of people in urban areas. The question arises: What are the human implications of the population increase in urban areas, which is partly, though not entirely, a result of the scientific and technological development? The object of this paper is to focus on the social and health implications of high-density living in urban areas. 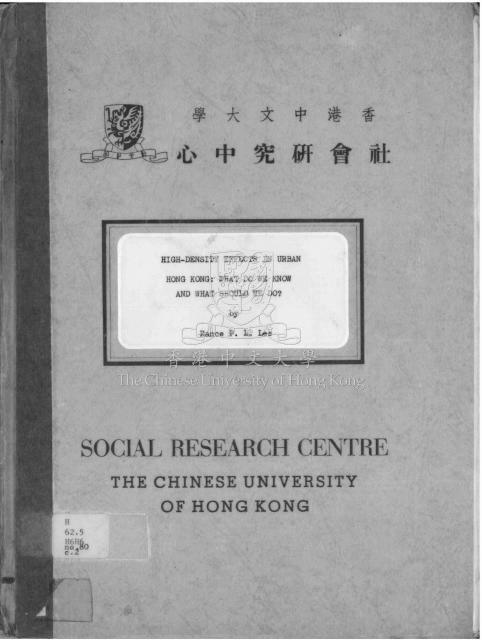 Special reference will be made to the case of urban Hong Kong.